The National Survey for Children's Health reveals that only 15% of youth with and without special health care needs receive transition planning assistance from their health care providers. 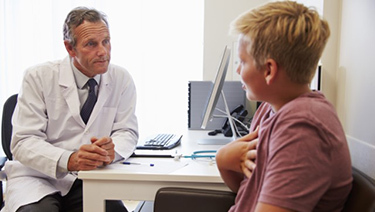 To address this gap, the American Academy of Family Physicians and American College of Physicians join AAP in calling on clinicians to establish a structured process to ensure a planned transition from pediatric to adult health care as part of routine care for adolescents and young adults. The clinical report, "Supporting the Health Care Transition from Adolescence to Adulthood in the Medical Home," provides new practice-based quality improvement guidance on key elements of transition: planning, transfer, and integration into adult care. This report, an update of the 2011 Clinical Report on Transition, will be published in the November 2018 issue of Pediatrics. "This new 2018 Clinical Report is an exciting extension of the thoughtful work of the AAP, AAFP, and ACP to offer practical assistance to their members regarding needed transition services for adolescent and young patients. It also identifies where further work is needed in the transition field," said Dr. Patience White, lead author of the report. The Six Core Elements process clarifies the roles of pediatric, family medicine, med-peds, and internal medicine clinicians in the transition process. Practical tools are provided and designed to be customized by the practice according to the needs of their patients and the resources available. In addition, the report summarizes the status of transition preparation among US youth, common transition barriers and preferences experienced by youth and families as well as pediatric and adult clinicians, outcome evidence, and recommendations for infrastructure, education and training, payment, and research. The transition from pediatric to adult health care is especially important for youth and young adults with special needs or chronic conditions, according to the report. Research has shown that without a structured transition process, youth and young adults are more likely to have problems with medical complications, limitations in health and wellbeing, difficulties with treatment and medication adherence, discontinuity of care, preventable emergency department and hospital use, and higher costs of care. This 2018 clinical report addresses the needs of special populations, including those with medical complexity, intellectual and developmental disabilities, behavioral health conditions, and social complexity. "When health care clinicians working in pediatric and adult care settings communicate with each other during the transfer of care and share records with each other and with youth and young adults, it assists the receiving clinician to offer better continuity of care," said M. Carol Greenlee, MD, FACP, Chair, Council of Subspecialty Societies, the American College of Physicians, also an author on the paper. Having the adult care clinician know something about them and their medical issues at that initial encounter helps the young adult feel more comfortable with their new clinician." Health care transition includes the process of moving from a child to an adult model of health care – with or without a transfer to a new clinician. That means having time alone with their clinician to respect their confidentiality and to learn how to manage their health on their own to the best of their ability. Physicians can help by recognizing how cultural beliefs and attitudes as well as social determinants of health may affect the youth's and young adult's health care transition. "Youth do not instantly become adults when they turn age 18, regardless of their new legal status," said Dr. Michael Munger, President of the American Academy of Family Physicians. "It is important to continue to build self-care skills and greater engagement in care with young adults. This report provides a framework to help make that happen."